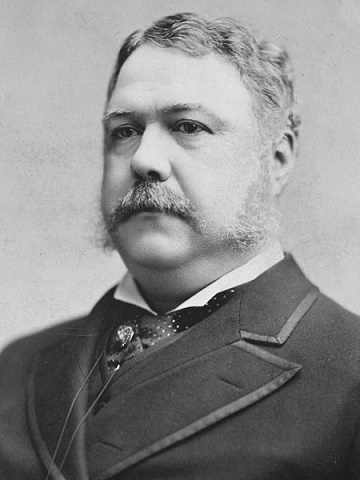 Chester Alan Arthur in 1881, wearing the fashionable sideburns of his day. 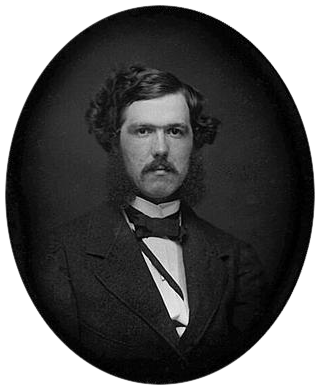 In 1881, Arthur had been recently widowed and was soon to to become POTUS-21, after the assassination of POTUS-20 Universal Education 1831-1881 James Garfield. For Bharani gentlemen, the condition of sweetly musical, artistic, harmony-seeking, negotiating, balancing, arranging, designing, matching, pairing, sensually pleasuring akarshana-karaka Bright Bhrigu may considerably affect the outcome. Nell Herndon was a notable singer, a beauty, wealthy and from a distinguished Virginia family. Arthur married his young wife following the death of her sea-captain father in a celebrated marine accident where the father safely transferred the women and children from his ship then drowned as he "went down with the ship" * an action considered then and now to demonstrate a highly noble character. Unfortunately their marriage occurred just at the opening of Civil War hostilities. While her northerner husband was an outspoken abolitionist, Nell favored the southern cause. Yet their New York City parties were society events and her lovely singing voice advanced Arthur's career within the Republican political machine. 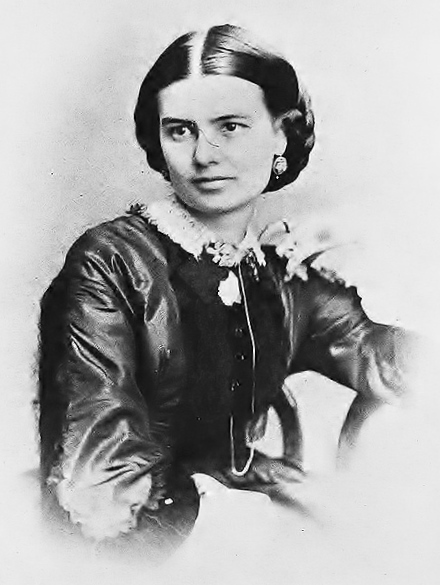 Suddenly on 12-Jan-1880 at her age 42, Nell died of pneumonia (the disease of grief). She was the mother of three children (two living). It was said that she died after years of neglect by Arthur, who seemed unable to spend an evening at home due to his back-room political dealings, his drinking, and other chronic distractions. She died just before Vice-President Arthur assumed office. Chester was the fifth of his father's nine children. Mom was a preacher's wife and mother to nine children. Nell Herndon was a New York socialite with Virginia roots. A gifted singer, she gave delightful parties featuring musical entertainments which promoted Arthur's career. Guru-Guru swabhukti surprised everyone * Guru in bhava-8 surprise! Then Arthur unexpectedly began to dismantle the federally protected criminal corruption system. Toward the end of his life, Arthur surprised all of his political machine friends by making reforms to the federal corruption system. It was literally his "last official act" to unseat the federal patronage system, because Arthur died shortly after finishing his presidential term of office. Arthur's leadership roles are not iconic or indeed egocentric but rather the product of his remarkable and enriching relationship-building skills, due to atmakaraka Zukra strong in navamsha-10 and Karakamsha = 3, management administration teamwork. Arthur's childhood home was resource-poor, often cold, and cramped. As one of nine children, he was moved many times from shack to shack while his preacher father changed congregations. The family's constant house-shifts are also seen via Ketu in 4th-from-Chandra. Arthur was a serious if not exceptional student. During Chandra Mahadasha, He earned a bachelor's diploma and a law license, and due to Shani's rulership of 10 + 11 he learned social etiquette at college as well..He certainly understood money, as seen from Shani's rulership of 2-3 from Chandra, his Bharani lagna, and his Zukra 10th navamsha. Rahu in bhava-6 * in swabhava of Busy Budha, the Shadowy Specter seeks privilege via glamorous or unusual arguments, defense of victims, conflicts, miseries, medicines, servants, accusation, injustices. Craves an environment of disagreement, injustice, crime. Desires a special, important role in matters of disease, injury, warfare, labor, unfairness, toxicity * Exciting, opportunistic, ambitious enemies. Rahu the Poseur may pose as a victim, a druggist, a litigator, a problem-solver, an abuser, a diseased person, an enslaved person, a relative of the mother's people. Bhava-6 = crime, war, pharmacy, self-medication = a materially successful location for boundary-breeching, risk-rewarding Rahu. Mr. Arthur spent most of his bureaucratic career working within the extensively corrupt political jobs-for-sale "machine" economy of antebellum New York City. He participated in, and eventually operated, an extensive bribery system = buy-sell political jobs (especially those jobs which involved collecting shipping fees and taxes). He started in the Customs Bureau and slowly his influence spread throughout New York. After a lifetime of party-going excesses Surya-yuti-Rahu -6 , Arthur himself died of painful kidney disease, age 57. Ketu-12 in 4th-from-Chandra indicates the constant movement of his family during his childhood, and his own habit of rarely being at home as an adult.